Lets step into the Way Back Machine and go to our childhood days. After school we sit at the kitchen table, listen to the Lone Ranger on the Radio (or watch him on TV). We have a snack of CocaCola and a Hostess Cupcake. Yum! 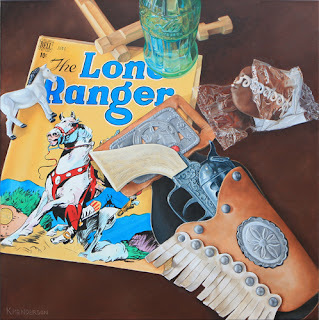 To assist the Masked Man in his adventures we have our Pony Boy six-shooter, holster with horse head and genuine plastic jewel, Lone Ranger Comic, a Silver horse figurine, and Lincoln logs. Q: Do you ever paint women? 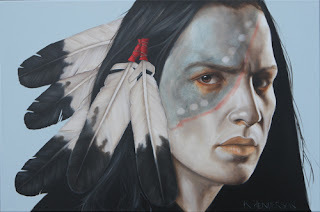 I did a commission of a young American Indian woman earlier this year and felt a need to paint another. And I wanted to keep it simple yet interesting. 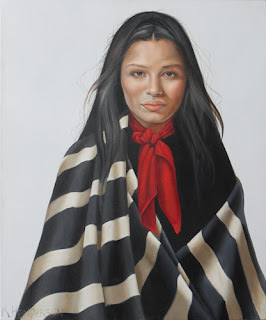 This young woman wears a striped shawl and a red scarf and captures you with here gaze and slight smile. Indian Market 2013 kicks off the third weekend in August. 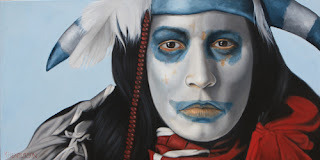 My paintings, including 'Longing of the Soul' are available at Huey's Fine Art just off The Square at 129 W Palace Ave. The Sacred Fool, or Sacred Clown is a pueblo Indian. These clowns participate in ceremonies trivializing important matters & exaggerating trivial events. Their purpose is to show how NOT to behave. They are teachers and keepers of tradition. 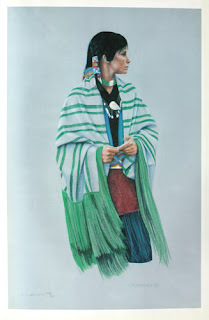 This Plains Indian wears eagle feathers wrapped with trade cloth. His face is painted white, red and blue/black. The time has come to re-introduce some of my work from the past. 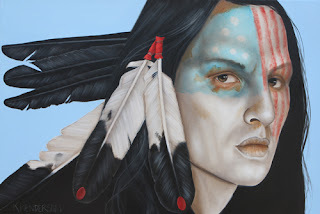 As many of you know, when I first started painting American Indians, my subjects were modern day pow-wow dancers. 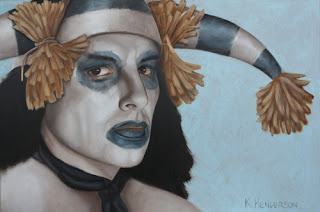 My medium was pastel, pencil or colored pencil. I had some off-set lithograph prints made of a few of my paintings and drawings. I still have some and I'm offering them for sale again. The first print available is Winds of Change. The original art work was created in colored pencil. This is a signed limited addition of 915. The price is $25. FREE shipping within the USA 48 contiguous states.